If you're planning a trip to Venice, some times of year are definitely better than others. Weather, festivals, and, of course, the acqua alta (high water) that Venice is so famous for should all be considered when deciding when to go to Venice. Taking all of that into account, the best time to visit Venice is November. If you want to have the city to yourself, it's best to visit in the off-season and while you may need to pack some layers for November's chilly evenings, the city is mostly tourist-free and hotel rates are much more affordable. While high water can definitely hamper your sightseeing, know that it has been a way of life for Venetians for hundreds of years and is a unique experience to have as a tourist. Late spring and early summer in Venice do offer the best weather. But the city during these beautiful warm days is packed with tourists (the May 1 holiday is particularly crowded), meaning that there can be long waits to enter museums and sights. Also during this peak time, finding accommodations—budget or otherwise—can be a challenge. Venice is similarly packed with tourists in late summer, even though the city can be oppressively hot, the canals ripe with odor, and the inevitable mosquitoes bothersome. The fall is a lovely time to visit Venice, but it is also when the acqua alta (flooding, or literally "high water") is more likely to occur. October through January is the typical high water season, though flooding can occur at any time during the year. Venice's location, in northern Italy on the Adriatic Sea, means that the city has colder, longer winters. While winter can be a great time of year to visit, especially in terms of getting a bargain and avoiding crowds, it can be harsh. The winds that whip off the Adriatic and down the alleyways are bone-chilling. Luckily, winter ends on a lively note with Carnevale, or Carnival, Venice's biggest festival. Venice's very busy season occurs in the summer when hotels are charging their maximum rates and tourists are packed into gondolas on the canals. Days are sunny and long, but Venice's inland location means that it can be quite hot. Venice has several big events that are worth booking a trip around. Carnevale dates usually fall in late February or early March, when tons of tourists descend on Venice for two weeks of masked and costumed revelry. Easter is also a festive time and is the start to the high season in Venice. Every other year, in odd-numbered years, Venice hosts the Biennale for Art. This international arts showcase is a world-renowned event and takes place from June to November. The Biennale is a very popular event, so be prepared to find Venice more booked up than usual when it is on. Yet another summer festival to see in Venice is the Festa del Redentore, which occurs the third weekend in July. This religious festival takes place at the Church of the Redentore, which lies on the island of Giudecca across from Saint Mark's Square. The festival is celebrated with the building of a pontoon bridge over the water, feasting, fireworks, and a gondola regatta. March is chilly and humid, but packed full of exciting festivals and events, leading into the Holy Week and Labor Day, a national holiday. By April, the weather has warmed up a bit, yet crowds aren't too bad, making it a nice time to visit. The Vogalonga, a world-class rowing competition featuring rowers from around the world, typically takes place in late May. Tourists crowd Venice during Easter. Don't miss the Benedizione del Fuoco, when the lights at Saint Mark's Basilica are turned off and a fire is lit in the space's entrance. Italian summer holidays kick off on August 15, but the months preceding are among Italy's best for festivals and events. Every other year, Venice hosts its eponymous biennale, a months-long contemporary art extravaganza that runs through November. The entire city hosts art exhibits, installations, lectures, and happenings in venues across the city. In July, Venice hosts the Festa del Redentore, which marks the end of a big epidemic in 1576. 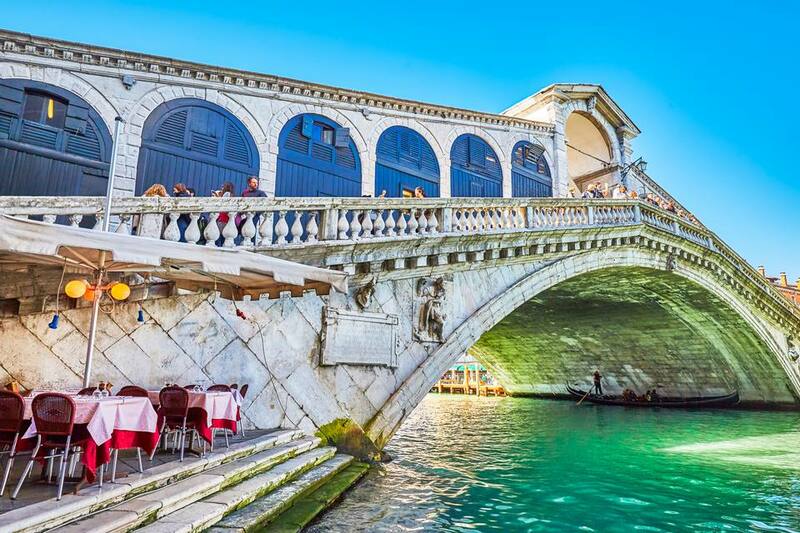 During this festival, the temporary footbridge from the mainland to Giudecca Island, which is created from a connected flotilla of boats, becomes one of the most famous bridges in Venice. In fall, tourists have left, leaving the city with fewer crowds and less expensive accommodations. Still, festivals and events are in full-swing in lively Venice. Note that later in the fall, weather can be quite brisk and in November, Venice often experiences acqua alta or flooding from high tides. On the first weekend of October, Venetians celebrate Festa del Mosto. On these days, locals spend time on the nearby island of Sant’Erasmo, the biggest island in the lagoon. This is where much of the area's produce is grown. Gondoliers race along the Grand Canal in September, as part of the Regata Storica (Historical Regatta), Venice's most exciting gondola race. There's always food, music, and lively fanfare. Weather in Venice during the winter may not be the best, as temperatures average just 43 degrees Fahrenheit and rain is common, but there are fewer tourists since cruise season is over. Don't miss New Year's Eve in the Piazza San Marco, where there's a big group kiss followed by fireworks. Carnevale, Italy's version of mardi gras, takes over the city in February. The Christmas season truly ramps up on December 8, a national holiday.